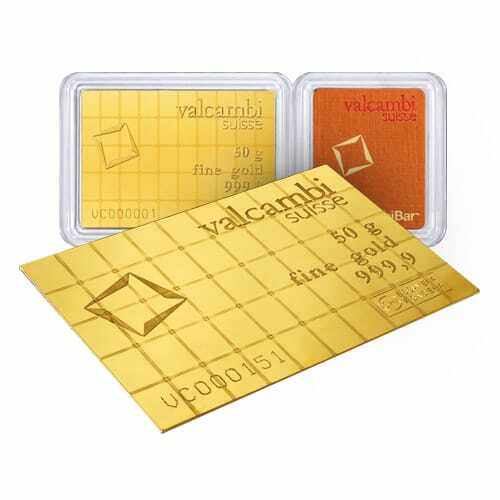 Valcambi CombiBars are ideal for those seeking gold that can be broken down into small increments. Thanks to the bar’s perforated edges, each one can be split into very small amounts, potentially for use in trade or as a gift. Produced by one of the world’s most trusted gold refiners, Valcambi Suisse, the bars have precise and predetermined breaking points. This enables you to easily separate them without loss of any material. One key advantage of the Valcambi CombiBar over most gold bars and coins is that resale procedures are often more flexible because you can split off only the materials you wish to sell. Another advantage is that the bars stack neatly, so when buying in large quantities, storage in a safe or deposit box is quite flexible. One of the most popular products is the 50 x 1 gram Gold CombiBar. About the size of a playing card, this product comes in bar form but can easily be broken into 50 separate 1 gram pieces. CombiBars are also available as 20 x 1g Gold, 100 x 1g Silver and 10 x 10g Silver bars. They are also available in Platinum and Palladium. Valcambi CombiBars are also eligible for contribution to your Self-Directed Precious Metals IRA. To learn more about Valcambi CombiBars and to get current pricing, please call us at (800)355-2116.